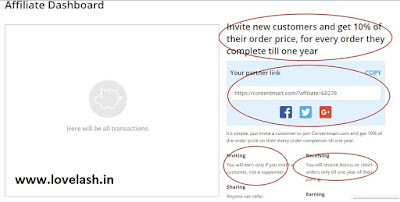 Home » Reviews » Contentmart Review – Scam or Legit ? Contentmart Review – Scam or Legit ? ContentMart is an article writing and outsourcing website. You can either sign up as a writer to write content and earn some money or you can sign up to outsource writers. The sign up for writers is simple, you have to bid on orders like other freelancing websites. You can simply start writing as soon as you sign up and set as winner for any order by clients. The same goes for outsourcing writers, all you have to do is post your project and a writer will start writing your article in no time after you assign hi/her the order. What does it takes to Sign Up ? Minimum Cash out Limit ? Signing up to ContentMart is free but you need to pass a test in order to begin writing articles on ContentMart. You can just sign up to ContentMart right now and start writing articles after clearing the tests. There are a number of articles to write and choose from at any given moment. Contentmart run test for writers to make sure that all writers are professionals and experts. They also have a rating system where clients leave a rating for writers. At ContentMart what you earn per article depends on your rank and the overall number of words for the article. As a Beginner writer you earn 200 INR for a 300 word article, 350 INR for a 500 word article and 500 INR for 700 word article. Advance writers can earn up to $15 per article. There are three ranks for writers at ContentMart Beginner, Intermediate and Advance. All writers start off as a Beginner writer. In order to achieve the rank of an intermediate or advance writer, you must have to clear a writing text. If you don’t want to wait to give tests then you can apply for the ContentMart verified writers test. With the verification test, writers can reach the contentmart verified writer badge by writing an essay. These test are free for every writers. The minimum cash out limit is 3000 INR and the only way to cash out is through Banking. Payments are made a number of times per month. Weekly payments are sent every Friday. Bi-weekly payments are sent every other Thrusday. Yes, ContentMart have a referral program. You won’t earn for referring a writer. 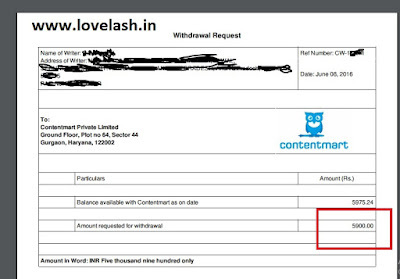 If a person you refer buys 1000 INR worth of articles on ContentMart, they will share 10% of this profit with the actual amount of purchase on contentmart for one year. This Referral Program is quite different and good from others because for one whole year, you will get 10% commission from one client refer by you on contentmart. ContentMarts have accepted various countries from registering on their website. They don’t state the names of the countries anywhere on their website. Here is my first withdrawal from contentmart within 2 weeks after registered as a copywriter. I have read many reviews online about contentmart before registration, Most of the reviews had a problem in common, and they were complaining that their articles were being rejected for no reason and later appearing on different blogs. Just like any other freelancing website on the internet you will find scammers on ContentMart. The thing to do in this case is that make sure that the writer you are writing for has a high acceptance rate and you have followed the instructions provided by the writer. Did you find the review helpful ? Want to add something to the review or share your payment proof please comment below. 1 Response to "Contentmart Review – Scam or Legit ?" Eastern Europe is getting more popular in terms of IT outsourcing. Here's everything you need to know about offshore software development in this region.